Minyip, a rural town in the Wimmera region, is at the intersection of roads between Warracknabeal, Murtoa and Stawell. None of the roads is a main one, but their existence probably accounts for the Minyip township being surveyed at its present location in 1875. Farm selections were taken up in the district from about 1873. It is thought that the name was derived from Aboriginal words meaning ashes or camping place. Several of the settlers were of the German-Lutheran tradition, from Hamilton and from Naracoorte, South Australia. Their social centre was Kirchheim about 6 km south of Minyip, where they built a church and a school in 1875. It was the district's only school until the government opened one in Minyip in 1879. Within a few years Minyip's population was over 400 persons, despite there not being a railway connection until 1886. 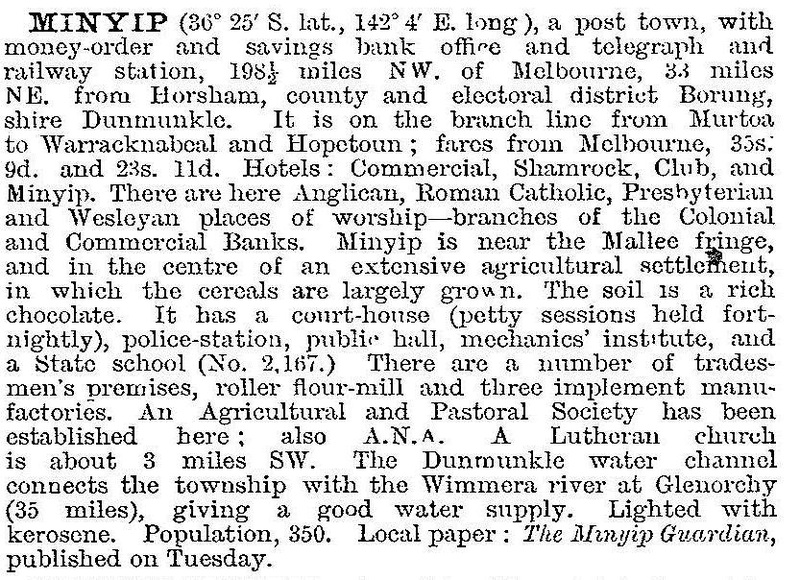 An implement works was opened in 1878 and in 1883 the Victorian municipal directory recorded Minyip as having four hotels, three stores, a public hall where court hearings and alternate Dunmunkle Shire council meetings were held, and a water-supply system by channels from the Wimmera River. In the year when the railway was opened a court house was built and an agricultural and pastoral society was formed. The Minyip Guardian newspaper began publication in 1885. The railway connected Minyip to Murtoa and Warracknabeal and the flour miller at the two latter towns opened a mill at Minyip in the early 1890s. Grain and flour could be readily moved between the mills to maintain stock levels. A burst of prosperity in the 1920s resulted in a district hospital and a swimming pool being built. During the 1930s the flour mill was closed and the Kirchheim Lutheran church was transferred to Minyip. The Lutheran school, however, was closed. In 1938 one of Minyip's notable commercial buildings, the Federal Arcade (1907) was burnt down. Surviving commercial and civic buildings now include the court house, the former post office, Colonial, Commercial and ANZ banks, Young's horse bazaar, three hotels and the railway station (1889). (The town has been used for filming the 'Flying Doctors' television series.) Registered buildings include the station and the Lutheran church. The historical society occupies the Guardian office, which ceased publication in 1963. Minyip has a range of modern amenities. There are golf, bowling, tennis and swimming facilities, Anglican, Catholic, Lutheran and Uniting churches, two small parks and a recreation reserve, a showground, a branch of the Dunmunkle medical service (formerly the hospital), a primary school (36 pupils, 2014) and a public hall. Minyip is a central receival point for grain harvests, and has large storage facilities at the railway station. Its historical society is an active publisher, as can be seen below under further reading. Minyip has several grand commercial, government and hotel buildings that have changed to residential use. The former Union Bank building (1909) is the premises of the first community-owned bank started by Bendigo Bank. The Anglican, Lutheran and Uniting church buildings also stand out; the Catholic building (1987) opts for a low-rise profile.